A few weeks ago I visited the Little Orme, one of two headlands found on either side of Llandudno Bay in North Wales (UK). It is a wonderful place to walk and take photographs with fascinating wildlife you generally wouldn’t see elsewhere. At Angel Bay, a small cove that cuts into the Little Orme, you can also watch the resident grey seals that come to rest on the beach. It was the perfect opportunity to take some shots with the new Olympus super telephoto lens (you can read my Olympus 300mm f/4 review here) and the MC-14 1.4x teleconverter. I started by taking some photos of them in the morning, a little disappointed that they wouldn’t come out of the water. 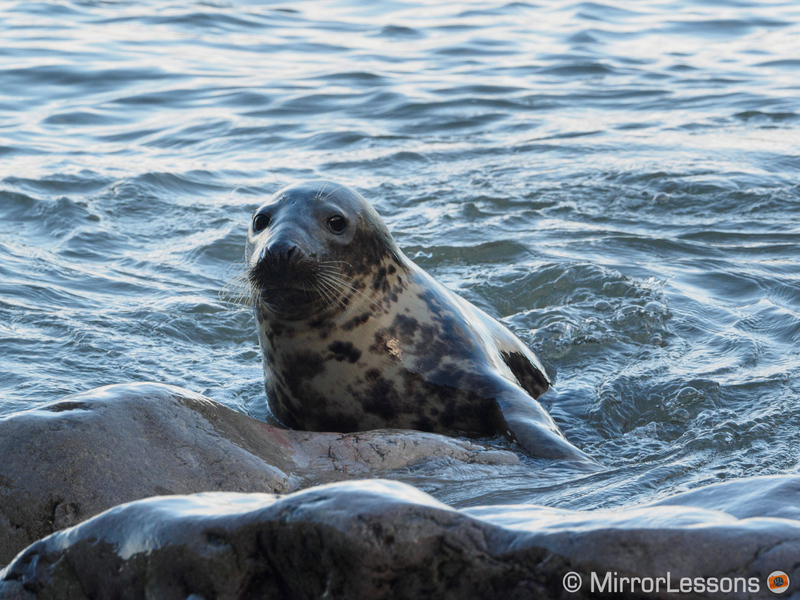 Once we returned to the bay in the late afternoon, however, there were nearly 20 of them relaxing on the beach. There is a sign that discourages people from walking down to the beach because the path is difficult to manoeuvre and more importantly, they don’t want tourists to disturb the seals and their pups. For this reason, I remained at the top of the cliff and decided to see how well the new Olympus Sync IS stabilisation would work for video. Sync IS combines the sensor shift inside the camera with the optical stabilisation of the lens (6 stops of compensation). For Olympus it is a first because the 300mm f/4 is their first OIS lens for Micro Four Thirds. In movie mode I set the OM-D E-M1 to the M-IS1 setting (software + sensor stabilisation), as it is the most effective for static shots, and tried to keep my body as still as possible by controlling my breathing and posture. Most shots were recorded at f/5.6, 1/50s and ISO 200 and no software stabilisation was added in post production. Combined with the IS on the lens, I admit I was quite surprised by the effectiveness of the stabilisation system, especially given the very narrow angle of view of my set-up (300mm + MC-14 = 420mm, which is an 840mm equivalent on a 35mm format camera). I even managed to do some slow panning with more than acceptable results. Of course it won’t substitute a proper tripod for video but it proves how good the new Sync IS can be. I have nearly 10 years of experience in filming and I can’t recall anything like it. I also think that this video demonstrates how quickly stabilisation technology is evolving. The Olympus 5-axis stabilisation is a reference on the market but it isn’t the only example – other brands are successfully implementing the technology as well. Sony has a 5-axis stabilisation system for their A7 mark II cameras while Panasonic has implemented a similar Dual IS technology on the GX8 (sensor + optical stabilisation). The latter is excellent for stills but not as effective for video. Optical stabilisation is also improving. Even without sensor stabilisation, the Olympus 300mm f/4 has 4 stops of compensation with the internal IS. Fujifilm does even better with some of its lenses (18-135mm and the new 100-400mm). My feeling is that more brands will start using dual technology rather than exclusively employing just one type of stabilisation or the other. Sony already does something similar with the A7 series and its OIS lenses but with less effective results. That said, knowing Sony, I am sure they will improve the performance in the future. My adventure into the world of photography began during my childhood. My parents gave me a Yashica fx2000 that I accidentally broke during a holiday in Rome. Growing up, my interests changed, only to return upon completing three years of cinema school in France. Over the years, photography turned into a profession, and the website MirrorLessons that my partner Heather Broster and I created became an outlet for my creativity. I haven’t settled on a favorite genre as of yet, but to travel and photograph are definitely the two things that make me feel “free".